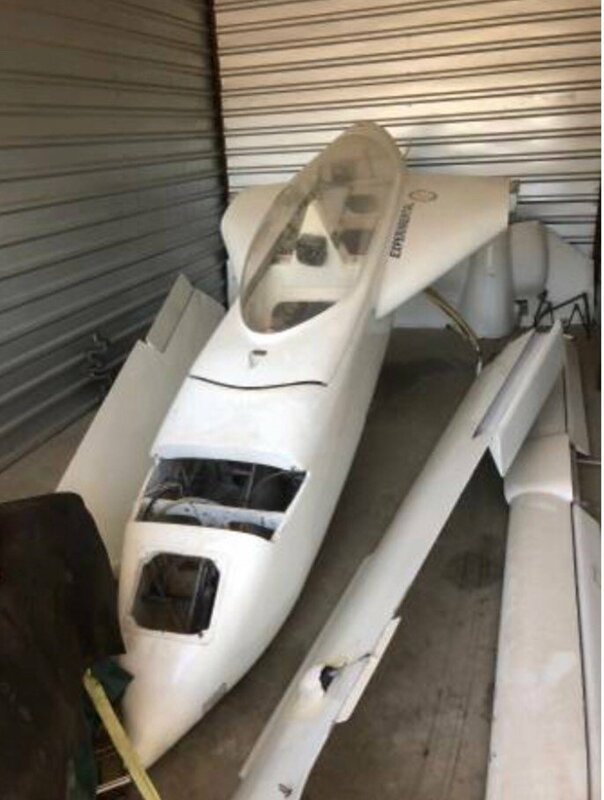 Ok, After a messed up situation of buying a LongEZ boat at OSH 2 years ago at the flymart - and then have someone STEAL it... I kept looking. Ran across a VariEze (the guy that sold me the LongEZ said he would keep his eye open for me - Thanks Trevor). Spent many days talking with the seller and getting as many picts as possible (the seller seemed to be pretty knowledgable about these birds and I felt he was not with holding anything. Took close up picts of things I asked for - as well as "issues" that he had found (and he wanted me to be aware of prior to buying). Know the wing attach concerns - hoping since the plane was completed in 95 - that the builder had taken extra precautions to ensure goodness in this area! Picts clearly show a coating - and zero corrosion. Will have a LOT of eyes on this when I get it to my shop to start the punch list! 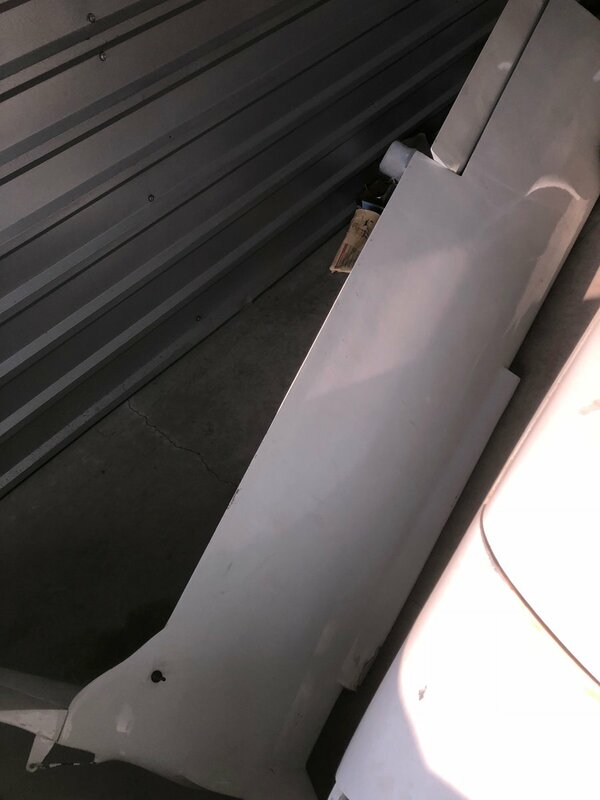 Have a guy in TX that does airplane parts hauling - and he said he will work me into his next trip up to my area (Charlotte). So if anyone needs anything from around the Dallas, TX area or somewhere between TX and Charlotte, NC let me know and I will get you in touch with him and we can share the transport costs! (and I can get my project sooner!). I will start a new thread and look forward to anyone providing feedback (and warnings!) as I get her back together. That's quite the introduction into a project! Nothing you can do but look forward at this point. Once you get the project in hands you can do a more thorough inspection. Moving beyond that you still have a full project to complete even if only to "re-assemble". If you're putting in a new/different engine then you have your hands even more full. Best thing to do IMO is to get all this as close to your bedroom as possible. Maybe your garage/shop then re-transport to the hangar? Consider yourself introduced and thanks for sharing. I moved this post to the Builder Progress section. Nah Jon, moving out of the house and into the hanger... ? I have a good size shop and right off my house and spend MANY hours in it now restoring classic/antique cars. I am fortunate to live 3 miles from my regular airport (but will be way too short to fly in/out of until a) I get REAL good at shorter takeoffs (and more important landings) with this slick plane b) cool temps (but know someone that is pretty active on a similar airport with a LongEZ (but he ONLY flys himself and not will full tanks and NEVER on a warm/hot day).. Probably a good thing that I do not have it in front of me - it gives me great time to read and learn. I know when I first get it - I am hopping in with the front level and making jet noises (probably for 4-5 hrs.). Ok - still waiting on shipper to "arrange" the travel... Took Marc suggestion to get a little history of the plane - contact FAA for all records... They sent me a generic readme file explaining what all the code mean - and this (see attached). So if FAA says this is "original copy" - I can print this out and have it in the plane when I fly - right? I do believe you missed the side you wanted captured on that PDF -- it's blank. I think this was the result of some automation - and no verification. There had to be some other docs on this plane (it was a flying airplane - so it had to have some other sort of records at the FAA). I know that experimental aircraft are "usually a little light" - but I think this is a bit on the extreme side! LOL!! It's HERE!!! That was WAY too long to wait for a delivery. I kept my cool (even though three times I almost went down and got it myself!). The guy was a nice guy and all - but a communications conscious, he was not. I finally got a call from him - but it was that his truck broke and he is jack knifed on the freeway (of a 3 day weekend - eveyone must have loved that too!). No injuries - a little trailer rash - but it is now here! I have started the punch list. First thing is to address the landing gear mains. Met a guy at Rough River - but lost his name in my phone (I put it with some clever reminder - like varieze or SOMETHING) - he said he has an extra main for the varieze... Now to figure out who it was and how to get it! The plane seems to be well built. the areas of cloth that I can see seem to be nice straight bid. Fit and finish is probably 7-8 (I am critical - I would say it was as nice as 90% that I saw at rough river (the rest were even better done). I need to figure out how best to document the work - and then link it back here in this forum. It is raining here - so good weather to be fiddling around! It looks pretty repairable. What's wrong with the gear hoop? If you post a message on the Canard Aviators Yahoo group, you might find the guy with the hoop. Otherwise I think you can still buy them. I hope you find all the engine parts. The gear hoop had delam of the BID. I was talking to someone and they indicated that there is a good chance the s-glass is still good and I can just relaminate.... want to get more experienced eyes on it (hint, hint...) and have a test plan (ndt) before I put it back into service. have a guy at the airport that is a huge O200 fan. Has been doing o200 builds longer than you and I, together, have been alive (ok, maybe he is not quite 100+ years old...). He said he will help get it all together and even better! 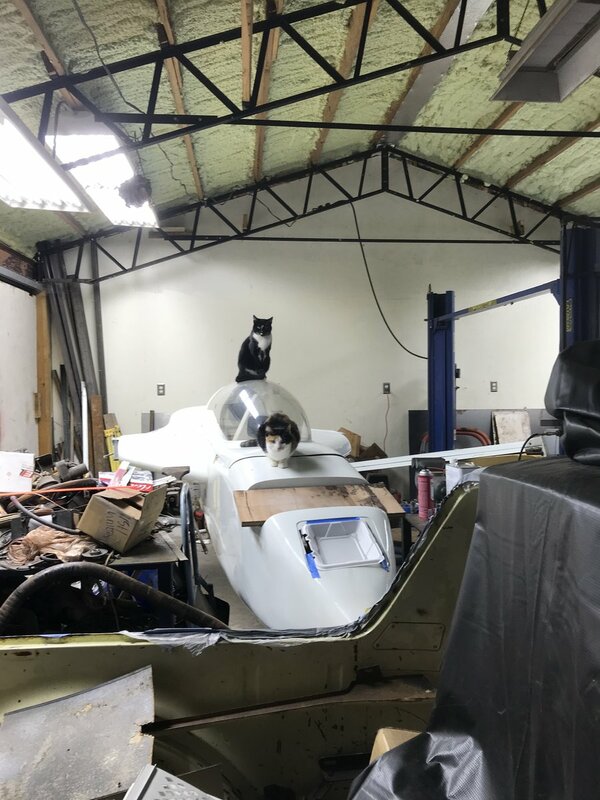 now to get the shop cats less interested in it! Port side gear BID delam. Looks like some peeled most of it off. Maybe a little too aggressive towards the top of the hoop (looks like a hoop of carbon on the top). The bid is still at the bottom and looks worse than the pict shows (no s-glass compromises). I disagree. It looks to me as though there are multiple spots on the left gear leg that are crushed, down near the axle and up about 2/3 way. Hard to tell from a pic, at least with regard to the top (without closeups), but the bottom - that looks like substantial damage. Also, it looks like something is going on on the bottom of the strut near the TE, but from this pic, it's impossible to tell what. 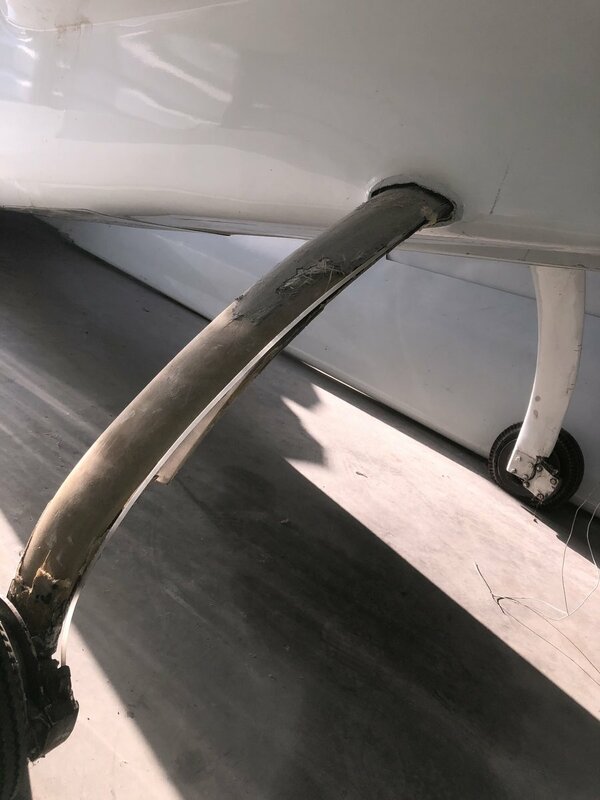 And if the gear leg is damaged from a hard landing, the chances are good that the fuselage attach points are also compromised - you'll need to jack the plane up and push/pull fore/aft on the wheels to check for relative motion at the attach points. Any motion more than 1/16" - 1/8" fore/aft at the axle means some damage at the attach points. Anything more than 1/8" and I begin to recommend repairs. It would be fun to take a look at it Mike. If you decide to replace the hoop, a new one is $816. It is probably a very doable project. Below are the pricelists for Aerocomposites with their address. Used to be "Featherlite" but now under new ownership in the same shop. i think the Picts are bad - it is hard to get a good shot at it. I looked at what I posted and now see what you are talking about. I do not see any crushing or irregularities on the s-glass in person. But that is why I am inviting others to cross check! good suggestion on jacking it up. I was building a rocking horse so I can flip it on it’s back. I will need it either way (repair/replace) - to gain better access to it all. But, by jacking it up, it will give me a much better assessment as to what I will be in for. i will try to take some close ups on some of those areas that you mentioned and see if I can get a better camera view of it all. 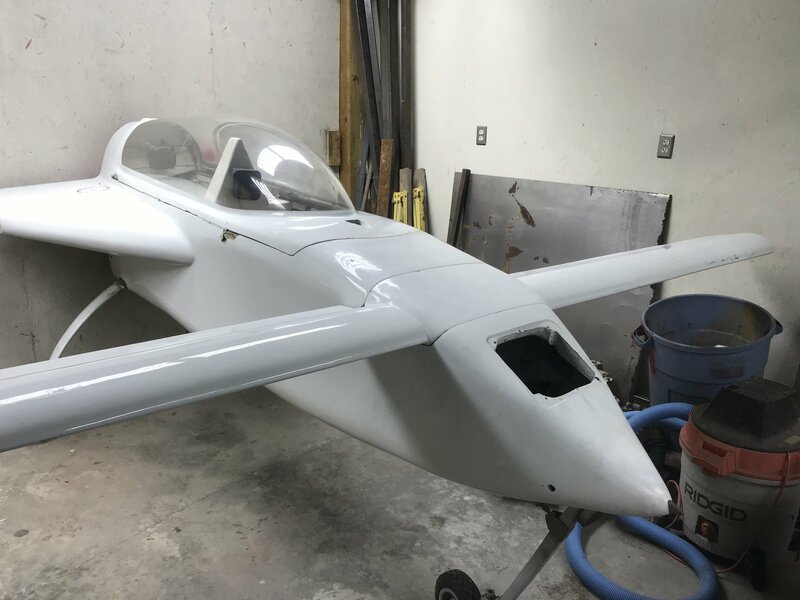 with fiberglass - anything is doable with enough time (and/or money). ? you our are welcome down this weekend to look her over. Should be nice motorcycle riding weather! (Watch out for wet leaves). I also had some delamination of the UNI and BID wrapping the strut on my VariEze. I peeled it all off and re-wrapped it. This time, every single ply wraps all the way around the strut and back onto itself at the trailing edge, which makes it a lot stronger. Using a hair dryer, it was not too hard to peel off all the glass and get back down to the bare strut. Below is a video of the delam that I discovered. The UNI and BID wrap the strut outside the lift tabs only and between the lift tabs. That is because the VariEze plans did not call for any wraps initially. The UNI and BID was later called for in two separate Canard Pusher newsletters. The builder of this plane did not feel like cutting off the lift tabs to wrap the entire strut, so he just glassed around them. Thanks Ron! Looking for the latest best practice for wrapping and layers. I know that there was "updates" in the number of layers to help prevent the gear splay. Checking thru the CP and CSA news letters for what others find have worked for them. Will search this forum also - the Cozy has 8 (4 from the back, and 4 from the front) of Uni per plans. I am in the clean up of what I got - and inviting others over to see what I do not... Once this is done, I will know what I need to focus on in my searches. I will decide to maybe forego any improvements like this until I get the game plan together to what it will take to get the bird back in the air.... It is the kind of scope creep that keeps people from flying! Looking for the latest best practice for wrapping and layers. If the hoop is not damaged, I suggest wrapping the hoop as described in the Long-EZ plans. You can find them here http://www.aryjglantz.com/p/documents.html I don't know if the Vari gear attach points are the same as the EZ but to wrap it like a Long-ez, you would need to cut the mounting ears off the hoop, clean it up, wrap it, and rebuild the ears. Ary has some good pics on his site, Chapter 9. Not a small job but it can be done. Cutting off the ears and rewrapping the strut is technically what is called for in the Canard Pusher newsletters. An early VariEze builder would have had to build the strut with ears and no wraps, and much later cut off the ears and wrap with UNI, and much later cut off the ears for a 2nd time and add BID (or the other way around). On my plane, the builder chose to just apply those wraps everywhere except for under the tabs. 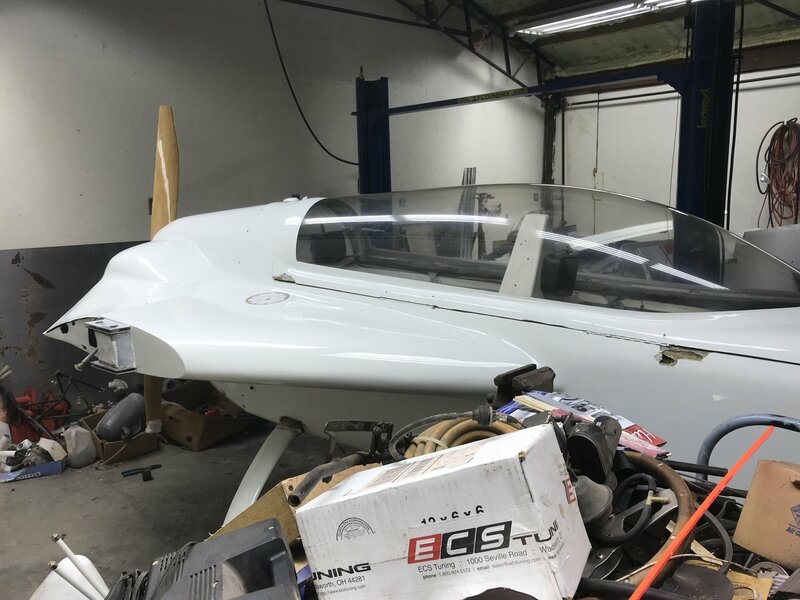 It has been working fine since the early 1980s with the exception of the delamination, but that had more to do with the lack of a glass-to-glass bond at the trailing edge. Now, to cover myself, you should definitely cut off the ears and wrap the whole strut because that is the only right way to do it! Well - got home (had to tend to another plane first) - but tried Marc's suggestion and lifted the whole plane and tried to move gear back and forth - no appreciable motion. then I mounted the bottoms of the struts and tried to move the fuselage - still pretty solid. Raining and nasty out - good weather to read some CP and CSA news letters - and enjoy some tea. Special thanks to David Orr who is helping me put some of the missing documentation together for me to baseline what I have. I appreciate people who when asked "X" - they find you the answer - AND they say "did you know about 'Y', 'Z', etc. " because one does not know what they do not know. I am still hunting for ANYONE with first hand knowledge of this plane (N350W). Without anything, I am going on the belief that it NEVER flew (even though there is evidence that it did ) - and am testing everything/anything to verify flyablility. This will include a FULL test flight regiment and documenting POH. I know I am pretty far away from this step, but want to instill that safety is on the top of my priorities list. https://registry.faa.gov/AircraftInquiry/NNum_results.aspx?NNumbertxt=350W I don't know what happened to Wilson. Teegarden is a doctor in El Paso, it appears. ...The builder did F4 LE vortilon (I am guessing)... Anyone know anything about THIS mod? That's not a vortilon, it's a drooped leading edge. It was an early standard modification to the plane to help with the aerodynamics that was later replaced by the standard three vortilons on each wing that you see on the LE of most VE's and Long-EZ's. It worked, but the vortilons were a lot easier to fabricate and install.